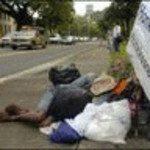 The homeless are increasingly victims of hate crimes and anti-poor laws by society. More families are out on the streets. We need affordable housing and living wages and solutions for a just society. Please join and help educate others! This humanitarian focused group posts messages which may contain copyrighted material the use of which has not specifically been authorized by the copyright owner. We are making such material available in an effort to advance the understanding of environmental, political, human rights, economic, democratic, scientific, religious, spiritual, and social justice issues. We believe this constitutes a "fair use" of any such copyrighted material as provided for in section 107 of the US Copyright Law. In accordance with Title 17 U.S.C. Section 107, this material is distributed without profit to those who have expressed a prior interest in receiving the included information for nonprofit educational and research purposes, and in the hope that more people will awaken and begin to think for themselves, as is so sorely needed in these times. For more information on fair use, please go to: http://www.law.cornell.edu/uscode/17/107.shtml If you wish to use copyrighted material for purposes of your own which go beyond "fair use," we suggest that you obtain permission from the copyright wner. Posts that contain Homeless per day for the last 30 days. 6 years ago (131 replies) | Hot! 8 years ago (47 replies) | Hot! 9 years ago (33 replies) | Hot!